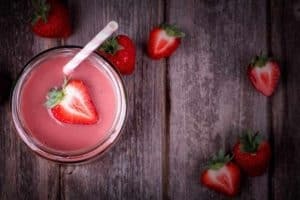 This strawberry banana fruit smoothie recipe is time-tested classic and likely something you’ve had before at a smoothie shop, like Smoothie King or Jamba Juice. The simple pairing of strawberry and banana is delicious and works great for breakfast or dessert. Add all ingredients into the blender container and secure lid. Blend on high speed for 45-60 seconds until smooth.